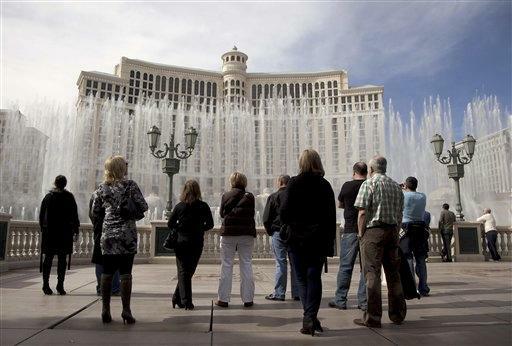 LAS VEGAS (AP) - The scenes that led to the Bellagio bandit's downfall look less like "Ocean's Eleven" and more like "America's Dumbest Criminals." Bragging about a big gambling score with high school buddies over rounds of shots in Colorado. E-mailing pictures to a total stranger - dated and signed "Biker Bandit" with two $25,000 Bellagio chips. Losing $105,000 gambling at the scene of the crime in Las Vegas, but cashing out nearly $209,000 and apparently hoping the casino wouldn't notice. The deceptively simple burglary lit up the Internet - appealing to anyone who's ever had fantasies about pulling off a major score against a casino giant. But police say Anthony Carleo's shoddy plan after stealing $1.5 million in chips unfolded like a badly played poker hand. "At one point I think he asked me, 'What do I do?'" said Matthew Brooks, a poker enthusiast from Washington, D.C., who went to the FBI after trading e-mails and phone calls with Carleo. "And I'm like, 'I don't know what to tell you, man.'" Carleo, the 29-year-old son of a Las Vegas municipal judge, declined to comment to reporters Friday. Police say he's the helmeted bandit who entered the Bellagio on Dec. 14, brandished a gun and made off on a motorcycle with the chips in denominations from $100 to $25,000. He was arrested Wednesday, a day after an undercover officer bought four $25,000 chips from him, then offered an invitation - to become part of a crew that would rob casinos, including the Bellagio. Carleo's response to officers: He'd already robbed the place. In between the brazen heist and the arrest, as Carleo gambled and partied, the cops were hot on his tail, according to an arrest report. Two days before Christmas, Bellagio security told police that a bell-ringer for the Salvation Army tried to cash a $25,000 chip along with a friend. The worker told police the chip was dropped into his pocket from an unknown man while he took donations from a walkway between the MGM Grand and New York-New York casinos on the Las Vegas Strip. Just after Christmas, Carleo spent time in his childhood hometown of Pueblo, Colo., buying "beer and shots for everybody," according to a friend. "He had a lot of money on him and he told us, you know he lives in Vegas and that he had just gotten lucky gambling and that he won $80,000 gambling," Tiana Woodruff told Pueblo station KOAA-TV. By New Year's Eve, Carleo was back at the Bellagio, losing $72,000 in one night and spending a week in January at the casino living for free on the casino's dime as a high roller. A source told police that Carleo liked to play poker and frequented the Bellagio's no-limit Texas Hold 'em tables with $10 and $20 minimum bets. On Jan. 4, Carleo lost an $11,000 pot, then left and came back a short time later with $5,000 in chips, the source said. His activity at the tables didn't match what he was cashing out, and casino workers noticed. Casino chips are like gift cards - they're extremely limited in where they can be redeemed. And the Bellagio swiftly replaced its line of $25,000 chips on the floor and announced they would no longer circulate those like the ones stolen. That's why Carleo was trying to get rid of his them on a secondary market, and he sold stolen chips to an undercover officer twice in the days before he was arrested. After losing big at the Bellagio, Carleo told people he knew from the poker tables he was behind the heist. A police informant told officers he'd heard about Carleo from a friend. "The friend also told the confidential informant that Carleo had mentioned that he was hurting for money and might have to do something drastic in the next several days," the report said. On Jan. 16, Carleo approached Brooks on Two Plus Two, a popular Web forum where the heist was a hot topic, with players discussing how the bandit might try to turn his chips into real money, Brooks said. Eventually, they talked by phone. At first, Carleo spoke vaguely at first about the chips, Brooks said, but gradually he became more specific. "That's when I kind of got more pointed in questions and asked specifically: 'Did you do this? Is this your deal or did you just get some of the chips and you know the guy?' And he said, 'No that's me,'" said Brooks, 29. Carleo e-mailed several pictures to Brooks depicting two $25,000 Bellagio chips - affectionately known as "cranberries" to gamblers because of their color. "Cranberries are good for the liver!" reads the postscript on the note in the picture. Brooks called the FBI, local police and the casino. Carleo was arrested Wednesday night without resisting, and admitted his involvement in the robbery, police said. Despite the suspect's seemingly unplanned actions after the heist, his return to the Bellagio wasn't all that surprising, said Dave Schwartz, a former casino security officer in Atlantic City who now runs the Center for Gaming Research at the University of Nevada, Las Vegas. Usually, he said, casino burglars come back to the scene of the crime to cash in chips or to try to steal more. Schwartz said the case showed how casinos and police are more measured and methodical than hasty when it comes to catching casino thieves. "It's not like they're going to chase the guy down in a shootout or do that kind of stuff, but they are going to follow through and eventually lead people to get tripped up," Schwartz said. "You've got to wonder what you can get away with." It was evident, Brooks said, that Carleo didn't have much of a plan. "It was not Brad Pitt talking to me," he said, referring to one of the stars of heist film "Ocean's Eleven." "It was not George Clooney."